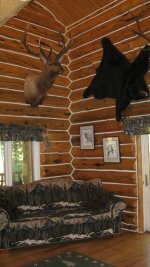 Our three-story log lodge was hand-crafted from logs that were burned in the greater Yellowstone fires of 1988. The logs were harvested from the nearby forest and the charred exterior of the logs peeled away with hand-drawn tools, then the logs were carefully fitted and assembled into this ruggedly beautiful home. The oak floors were custom milled on site, as well as the hand-crafted pole furnishings. We have six spacious guest rooms, each with one or two queen size beds and their own private bathrooms. Amenities include satellite TV in the main living room area, long distance telephone service, Ping- pong and foosball, a small library, and a hot tub out on the deck. A small refrigerator, microwave and hot drinks bar in the Dining room area are for your use. There are also picnic tables, a BBQ grill and campfire ring. A delicious, "sit-down-and-be-served" breakfast is included with the price of your room and is served from 7 a.m. to 9 a.m.
Pets are welcome with permission, there is a $25. per night additional charge for pets. The lodge and all rooms are non-smoking. *Please note -We are snow-locked in winter! One room: 7 days, Two rooms: 14 days, Three or more rooms: 30 days. Advance reservations (9 months or more): 30 days. 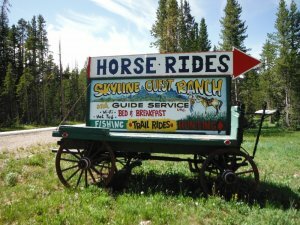 Look for the sign on the old-fashioned wagon marking the lane to our place!